Located at the confluence of Yangtze River and Jialing River, the mountain city Chongqing is the starting point of the downstream Yangtze River cruise tour. Traveling in and around Chongqing, you can explore modern Jiefangbei CBD and ancient Ciqikou Town, capture the natural wonders in Wulong and appreciate the vivid rock carvings at Dazu. 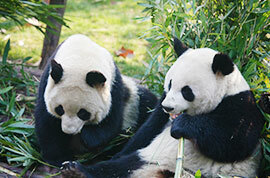 In addition, the frequent high-speed trains make it easy for you to extend your Chongqing tour itinerary to Chengdu. How to Plan a Chongqing Tour? Generally speaking, one day is sufficient to visit the main tourist attractions in downtown such as Ci Qi Kou, Jiefangbei CBD as well as pandas in Chongqing Zoo. As darkness falls, you are recommended to appreciate the splendid night views of this mountain city that boasts "Little Hong Kong" at Hongya Cave or Chaotianmen Dock. Your Chongqing tours can also be extended to the suburb areas like Wulong Karst National Geology Park and Dazu Rock Carvings which is a 2-3 hours' drive. In this case, additional full day is needed respectively for these two places. Besides, enjoying the fascinating sceneries of the Three Gorges on Yangtze River is another must-do thing for travelers, and it takes 4 days to have a Yangtze River Cruise tour from Chongqing to Yichang. You are free to choose different tour routes of our Chongqing private vacation packages according to your own interest and schedule. For more tour plans, you can refer to the Top 10 Things to Do in Chongqing. How to Get to Chongqing? Chongqing Railway Station and Chongqing North Railway Station are two main railway stations in the downtown area. Chongqing Railway Station (Caiyuanba Station) is mainly for the ordinary trains running between Chongqing and other cities like Xian, Shanghai, Kunming and Guiyang. However, North Railway Station, also called Longtousi Railway Station, serves not only normal trains, but also bullet trains and high-speed trains to most major cities in China. 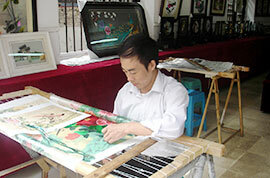 What's more, it is convenient to start a Chongqing trip from Chengdu by taking a 1.5-2.5 hours’ high-speed train ride. Chongqing is the biggest inland port city on the upper reaches of the Yangtze River and even in western China. 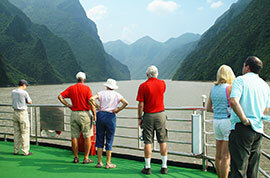 Reaching Chongqing by ship from Yichang, Wuhan, Nanjing or Shanghai is also a very popular way of travel among tourists. China's 72-hour visa free transit policy is applied to Chongqing. Foreign travelers who meet the requirements can apply for the permit at Jiangbei International Airport and stay in the city within 72 hours (3 days) without a Chinese visa. Known as one of the 'three furnace cities' in China, the weather of Chongqing in summer is incredibly hot and muggy. Therefore, if possible, try to avoid the summer months and come in March-May or September-October which are considered to be the best seasons for Chongqing tour package. With the humid climate, Chongqing - a paradise for food enthusiasts is famous for the spicy cuisine, especially the hot-pot. You can have a taste of some local food at Ci Qi Kou and Jiefangbei CBD if interested. When traveling to Chongqing, a pair of comfortable shoes is recommended as the unique geography makes the roads in the city not very easy to walk. In addition, it is necessary to take some warm clothes if you visit Wulong which is located in the mountain area with big temperature difference between day and night. Join us! Discover more of Chongqing! Can we travel by ourselves to chongqing's suburbs? I have a trip plan to Chongqing on next march 5-10, 2019. 1. How's about the weather on March? 2. 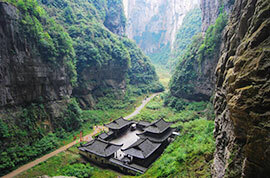 How to go explore: Wulong Karst National Park, Fairy mountain without tour, or have to join some tour at hotel? 3. How to go explore: Dazu Rock Carving by our self, how to take the bus and get the ticket for return? Please give us some advises, Thank you. In March, the weather of Chongqing is getting warm with an average temperature of 11°C ~ 17°C (52°F ~ 63°F). March is generally regarded as the beginning month of spring when everything comes back to life. With the climate getting warmer, you can bring some thin clothes. However, cotton wadded jackets, light sweaters and wind coats are necessary, for they can protect you from coldness at night. For visting Wulong Karst National Park, you should take the earliest train from the Chongqing North Railway Station at 6:25 am to Wulong Railway Station. It will be about 9 am when you get to Wulong. And then you need to go to Wulong Bus Station to take the bus to the Tourist Center. Or you can just take a taxi after getting off the train. Considering that this scenic spot is in the suburbs, and there may be language communication problems, I suggest it is better to join a local one-day or two-day tour group. If you would like to visit Dazu Rock Carvings by yourself, you may take a bus from Chongqing Bus Station also known as Caiyuanba Bus Station, or Chenjiaping Bus Station to Dazu County Bus Station in around two hours. 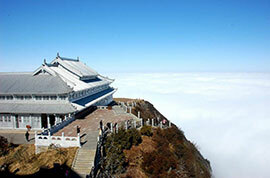 After arrival, take bus 205 to Baodingshan Rock Carving Scenic Area. And you need to get back to the Dazu Bus Station before 3 pm to avoid the evening traffic jam on Chengdu-Chongqing expressway. how can I travel from SWUPL to Dazu stone carving using metro rail service? There are two campuses of SWUPL. If you are at Shapingba campus, you may take the Bus No.219 at the Lieshimu Station to Chenjiaping Coach Station and then take the bus to Dazu County in about 2 hours. 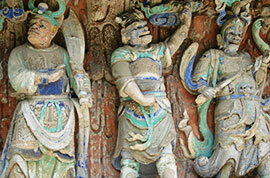 After arrival, you can hail a taxi with a cost of around CNY15 to Dazu Stone Carving scenic spot. If you are at Yubei campus, you need to take Bus No. 619 to Damiao Longhu New One Street Station first and then transfer to the Bus No.618 to get off at Caiyuanba Railway Station. Afterwards, walk to Caiyuanba Coach Station and continue to take the bus to Dazu. Upon arrival, hail a taxi to the destination. Hope it helps. How long does it take from North Station to Jiangbei Airport on Subway? Which terminals does it cover and how far to walk from Subway to Terminals? Thanks. It takes about 40min to T2 of the airport. Follow the signs, walk through an underpass and you will get to the terminal within 5-10min. I would like to rent a car for 9 seat from Chongqing to Jiuzhaigou including driver. How much cost will be? And do you have contact or not? It is not suggested that you rent a car to Jiuzhaigou from Chongqing as the route is very far and the cost is high. The fastest way is by flight and the air travel takes about 1.5 hours. To save the cost, you may also consider taking the direct bus to Jiuzhaigou. The bus departs at 08:00 in the morning from Caiyuanba Bus Station. The ride takes about 11 hours and the fare is CNY198 per person. I would like to buy boat ticket in advance to go to shibaozhai. How could I get ROUND TRIP ticket back to Chongqing on the same day? Earliest in the morning. last boat ride on evening. There is boat from Chaotianmen Pier to Zhongxian and the ride takes around 4 hours. Then change to a bus to Shibaozhai. For the boat tickets, you are suggested to go to the wharf to check it in advance. Alternatively, you may also take bus to Zhongxian (about 2 hours) and then change to another bus to Shibaizhai (1.5 hours).